Liberal and Democratic leaders from all parts of Asia assembled in Bangkok from December 9 to 12, 2003 to celebrate the tenth anniversary of the founding of the Council of Asian Liberals and Democrats (CALD). 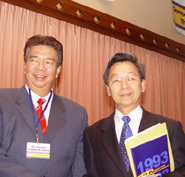 As an umbrella organization of liberal and democratic political parties CALD was inaugurated in Bangkok in 1993 with the active participation of Thailand’s Prime Minister Chuan Leekpai and South Korea’s Kim Dae-jung. Prominent Liberals from Europe also attended the anniversary conference entitled Current Political Challenges for Economic Growth in Asia. The delegation of the Liberal Party of the Philippines (LP) was headed by Senate President and LP Chairman Franklin M. Drilon. Addressing the international forum, Drilon emphasized that democracy is compatible with Asian values. The challenge is now for us to show our friends in the west that democracy works in Asia, the Senate President told the conference. Drilon was joined in Bangkok by LP president Congressman Florencio Abad, LP Secretary General Congressman Rudy Bacani, LP Vice President for Mindanao Dr. Nereus Acosta and Governor of Antique Salvacion Perez. In his keynote-speech the former Prime Minister of Thailand Chuan Leekpai discussed the political challenges for democracy in Asia. Speaking to the leaders of liberal and democratic parties from the region, Chuan said that political parties play a crucial role in the process of democratic consolidation. “Their basic function is to educate the people, while at the same time providing checks and balances, he said. The CALD-anniversary conference was co-sponsored by the Friedrich-Naumann-Foundation. Addressing the delegates FNF-chairman Dr Otto Count Lambsdorff said that the liberal Foundation is committed to continue the cooperation with CALD. “If you wish, please consider this commitment as a sort of birthday present”, count Lambsdorff told the delegates. The conference program and the texts of the main speeches are available at www.cald.org.